Welcome to day 17 of our countdown, today its my turn to share another project with you. I have been making some christmas gift tags as I have decided to wrap my presents in brown paper and really decorate with ribbons so wanted my gift tags to match with this theme. 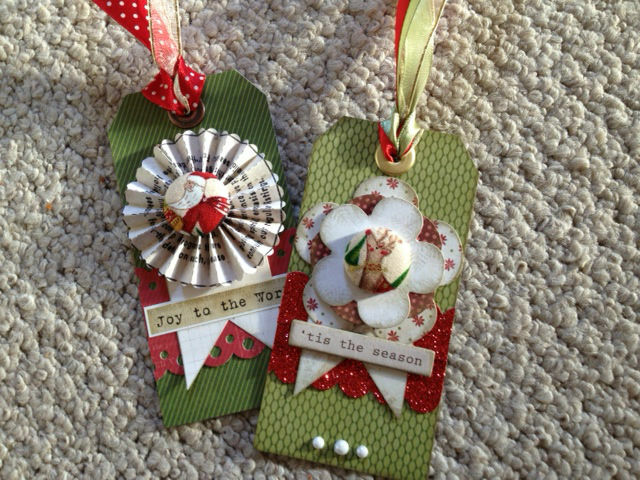 See the page at the top of my blog for instructions should you need any but this is the finished results, I have used Echo Park Very Merry Christmas and Teresa Collins Christmas cottage both available from Creative Craft World. I will take photo's once they are on the gifts too and share, I need to do my christmas shopping before I can do that. Been so busy making things I haven't done the shopping yet. LOL! Thank you for popping in and see you tomorrow for another festive project. Ooh these are lovely, Lou! I will definitely be having a go. Gorgeous Lou, now I want these papers lol!